The pope’s close advisor, Rev. Antonio Spadaro, who edits the quasi-official Vatican journal La Civilta Cattolica, defend Pope Francis’s apparent defiance of the infallible Council of Trent on divorce and remarriage, by explaining that in theology, “2+2=5.” No one knows quite what that means, but perhaps that’s the point. The bishops of Malta have published a set of guidelines for Holy Communion based on Pope Francis’s ambiguous document Amoris Laetitia, which openly depart from Catholic teaching and practice of 2,000 years. The Vatican’s response? 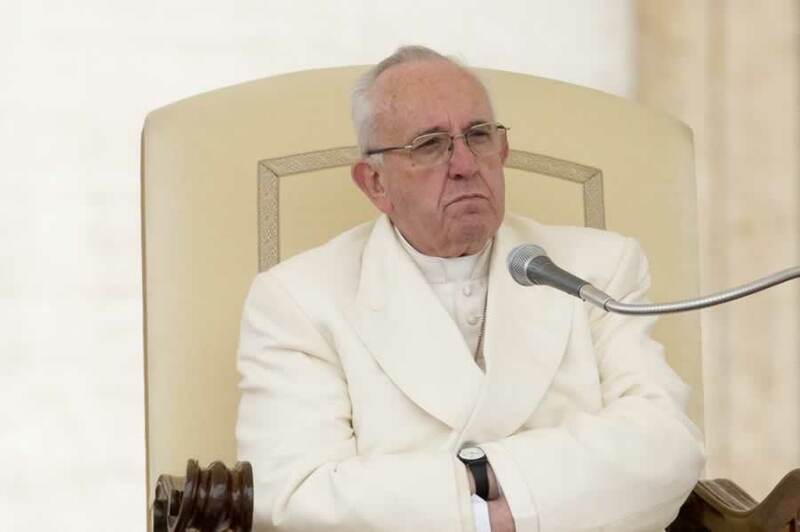 To publish those guidelines, without criticism, in the Vatican’s L’Osservatore Romano. The Vatican’s science congregation, led by Argentine Bishop Marcelo Sanchez Sorondo, has summoned a conference on biodiversity, and invited as a speaker Paul Ehrlich — a discredited “overpopulation” crank who favors coercive population control and abortion. As Professor Michael Pakaluk of the Catholic University of America revealed, papal ghostwriter, Argentine Archbishop Victor Fernandez, committed plagiarism in the text of Amoris Laetitia — lifting paragraphs almost whole from Fernandez’s own, wacky theological speculations. Some of the most troubling parts of that document which the pope made his own are snipped and tucked from an article where Fernandez asserts that absolutely every human being is saved. At least Fernandez didn’t (so far as we know) include any passages from his 1995 book: Heal Me with Your Mouth: The Art of Kissing. And we still have 50 more weeks to go! In light of all this dumpster fire smoke, it seems useful to examine the very narrow limits within which papal authority is circumscribed by the Church’s perennial teaching. Otherwise, well-meaning people might very well get the idea that the Catholic Church is morphing before our eyes into a mainline Protestant denomination. Plus bingo. Q: As I remember, you Roman Catholics used to take the occasional jab at Protestants for the moral chaos that erupts when you don’t have a central authority — you know, a trustworthy figure whom you’re certain will keep the church’s doctrine the same as it always has been, since the apostles. A: Yes, some of us did. Q: So… how’s that working out for you? A: Very funny. I’d bring up Benny Hinn right now, but I frankly don’t have the heart. Q: So has Pope Francis’s behavior led you to re-evaluate papal authority? A: Absolutely. It’s forcing us to hunker down and realize exactly what it was that Christ promised us, and what He didn’t. Thanks to Pope John Paul II and Benedict XVI, we Catholics got good and spoiled. Both men were well-educated, highly intelligent, deeply benevolent, and devoted to the historic teachings of the church. It was easy to assume that every pope would have to have all those attributes — though of course a reading of Renaissance history (for instance) would have told us something different. A pope really can have none of those attributes, and still hold the throne of Peter. At such times, it’s only the Holy Spirit that protects us against our shepherd. Q: Fair enough. Without getting into all sorts of Catholic inside foosball, explain to me how you can still be Catholic and reject what the pope is saying and doing on crucial areas of faith and morals. And how can he apparently contradict what previous popes and councils have solemnly taught on those issues? Can a Catholic Reject What the Pope is Saying? A: Okay. The whole idea of church authority which Catholics and Eastern Orthodox hold, and which virtually every Christian on earth accepted until 1517 — I’d like to remind you — is this: Jesus taught the apostles many things, not all of which got literally transcribed in the documents which decades later were written, and were compiled by bishops into the New Testament. Those truths which Christ taught them, which they preached to the first Christian communities and then from the pulpits of churches, were key criteria which the church used when it discerned which “gospels” were authentic and divinely inspired, and which ones were pious fictions. Did this “gospel” match what the bishops had learned from their predecessors, who learned them from Jesus? For instance, it is possible to read the New Testament and be confused about whether Jesus is co-equal with the Father. Millions of Christians (called “Arians”) got that wrong. It took the bishops of the Church gathered in councils to clear up such misunderstandings (“heresies”). That body of teachings which bishops passed down for three hundred years before the Canon of scripture was “closed” has a name: We call it sacred (big-T) Tradition. It is not the traditions of men, but the handing-on (traditio) of what Jesus taught the apostles. Combine those truths with the truths of scripture, and you’ve got the whole megila, which we call the Deposit of Faith. It’s the job of the bishops and the pope to hand on that Deposit of Faith, unchanged and untarnished by human inventions, from one generation to the next. Think of it as a relay race. How Can We Recognize Authentic Teaching? Q: So how do you determine what’s the authentic Deposit of Faith, perhaps rephrased or clarified, and what are human corruptions that a wicked or stupid bishop or pope has decided to slather on top of the baton? Q: What’s the ordinary kind? A: That refers to statements by bishops and popes that simply repeat, perhaps slightly rephrased, what the church has always taught since the age of the apostles on a given subject. These re-statements of previous church teachings don’t claim infallible authority, but Catholics are supposed to defer to them, on the assumption that bishops and popes probably know the Tradition better than we do. That’s usually a pretty good bet. Q: What happens when a pope says something that isn’t grounded in Tradition, but is simply his own idea or interpretation? A: Then it’s not part of the Magisterium, and we have no duty to defer to it. Q: What about when the Church has said one thing in one century, and another thing later on? For instance, after Constantine made Christianity the official religion of Rome, bishops suddenly wanted the government involved in policing people’s religious faith. But at Vatican II, the church renounced that idea, and went back to its old call for religious freedom. A: That didn’t go back to the Apostles, you’ll notice, so it could never have been part of the original Deposit of Faith. But the very fact that the church took two opposing positions at different times means that it was never part of the ordinary Magisterium. The same thing is true of lending money at interest and slavery, on which church authorities have expressed conflicting opinions. Most political and economic questions, except at the very highest level of general principle, cannot be settled by appealing to the Magisterium. So you can’t put together a Catholic ideology based on what popes have said over the centuries. It just doesn’t hold together. That’s not true of dogma and doctrine. Q: Now the question of divorce and remarriage has been settled, infallibly as you say, by the Extraordinary Magisterium. So if Pope Francis were to say, “Yes, I am teaching something new on divorce, remarriage and Communion. …” You wouldn’t be obliged to defer to it? A: No, we’d have the duty to scream our heads off and reject it — as the laity rejected the Arian heresy, even when a pope got squishy under pressure from the emperor. If the Catholic claim about papal infallibility is true, no pope would live long enough to sign an ex cathedra document that taught heresy. Q: So that wouldn’t be part of the Magisterium? A: Not at all — because it doesn’t repeat previous teaching, but contradicts it. Now Jesus was able to come along and say things like, “Moses taught you X, but I say unto you Y.” You know why He could do that? Because he was GOD. Okay? That’s not a power which every pope, or any pope, is given. To say that really would be idolatry, treating popes as if they were God. Q: But aren’t Vatican officials and bishops claiming that the new teaching in Pope Francis’ document, Amoris Laetitia, is part of the Magisterium? A: Yes. They are misrepresenting the truth — as Bishop Sorondo did when he claimed that Pope Francis’ opinions on the scientific details of climate change were Magisterial teaching. Q: What if Pope Francis decided to issue an infallible statement, insisting that the Maltese bishops’ interpretation on divorce, marriage and communion are authentic Catholic teaching? A: In such a situation, we believe the Holy Spirit would intervene. As Catholics, we believe that God would veto such a statement. Q: How would He do that? A: Look back at scripture for examples. Noah’s flood, the destruction of Sodom and Gomorrah, the fate of Onan. It’s not for me to predict what means He’d decide to use. But if the Catholic claim is true, no pope would live long enough to sign such a document. Because if you had a real discussion with a real Protestant it might not have gone as glowingly as you painted it here, what with your re-writing of history and all. I would suggest anyone reading this article now is a good time to finally do the research on the first 400 years of biblical Christianity so you don’t get swayed by some the falsities here. They have a fairly-priced MP3 series at CBD that will get you started. Saint Ignatius of Antioch: ” Wherever the bishop shall appear, there let the multitude [of the people] also be; even as, wherever Jesus Christ is, there is the Catholic Church.” Epistle of St. Ignatius to the Smyrnaeans about 70 years after Christ ascended into Heaven. — Same Letter to the Smyrnaeans, Ch 6. The quotes could be multiplied in the hundreds. Belief in a 66 book Bible is as unbiblical as one can get. Nowhere does the Bible teach such a concept. My Catholic Bible has 66 books, plus. The council of Carthage was a provincial council, not universal, so even by RC standards, it would not be binding and authoritative. And throughout Church History, we can clearly see that the Churches who had knowledge of the Tanakh rejected the Apocrypha, while churches and areas that were largely ignorant of it accepted them. As somebody said earlier, the Jews of that time never accepted those books as being holy scripture, and always differentiated them from the Tanakh. The above response is a typical Protestant non-response to the question: How did God reveal to us the canon of Sacred Scripture? Further, what part of the Bible does one consult in order to test the Protestant assertion that the Bible contains only 66 books? Book, chapter, and verse, and Bible only, please. A person who believes in Sola Scriptura rejects anything based on oral tradition that cannot be proved from the Bible. How does one test whether the canon he uses is correct? Protestants are unable to answer those questions. What is nonsense is the Catholic Claim that the Roman Catholic Church created the cannon of Scripture, as if the Church had the authority to declare what God had inspired. I would say that God didn’t send down a cannon list. He inspired writers to write books of scripture. The early church recognized the authority, coherence, apostolic approval, and harmony with pre-existing revelation as traits of Scripture. There is a reason that the Apostles were doing miracles for a period in Acts. Mosaic Law dictates that for somebody to be speaking on God’s behalf, they must either show signs and miracles, or predict future events with perfect accuracy. That’s why we can trust the Apostles, and view their teaching as being God’s Teaching. The early church passed on those books written or overseen by Apostles to us. You completely miss on this. My point is that Cannon is an artifact of inspiration. There is a cannon because God inspired certain books to be written, and did not inspire others. You are treating Cannon like some list floated down from heaven accompanied by angelic choirs. I think you are more in the pickle here. You claim the RC church defined scripture, but on what authority? You will quote me verses from the bible to try to claim authority for Rome, but what that really ends up being is a circular argument. Rome has the authority to define what scripture is and how it is interpreted based upon authority they derive from their interpretation of scripture, which they have already defined as being Scripture? What would the good Roman Catholic believer in the first century, (not that I think there was such a thing the first few centuries) have read as Scripture prior to a council defining what scripture actually was hundreds of years later? I will just stand with Paul when he tells Timothy to look to Scripture for guidance. This would have been the perfect time to tell Timothy to look to Peter, and his successors, as they will lead you into all truth. Instead, he says when controversy and difficulties arise, look to the holy Scriptures. Evidently Paul already had something in mind. Notice what is missing from the response? Any reference to Sacred Scripture to demonstrate that the Protestant canon of 66 books is correct. Why do you care about anyone else’s opinion on this matter other than God’s? And how did you determine what God’s opinion on the issue is? The same thing the good Protestant believer in the first century would have read. The question is: How did that Protestant believer determine whether what he was reading was actually Sacred Scripture? When Paul told Timothy to look to Scripture, what group of books did he have in mind when he told him to “look to Scripture”? Further, where can I go to test your answer to that question? What the Protestant does on this issue is to basically deny the validity of his doctrine Sola Scriptura. If Sola Scriptura were true, then the Bible is the sole criteria to judge the validity of the Protestant canon. Thus, the only logical conclusion an objective person can come to is that Sola Scriptura is not a true doctrine. And if it’s not (and it isn’t), then all of Protestantism falls, as all of Protestantism is based on that doctrine. the problem you keep running into is that you are mis-defining what Sola Scriptura means. You will continue to ask the wrong questions and come to error on the position until you actually start understanding what is meant by it. Sola Scriptura is the Christian theological doctrine which holds that the Christian Scriptures are the sole infallible rule of faith and practice. When you assert that Sola Scriptura fails because the bible doesn’t say what the canon of the bible is, you are showing that you don’t understand the subject. Sola Scriptura is not saying that everything that a Christian should know is found in the bible, but that the Bible is the sole infallible rule of faith and practice. Talk about the content of the Canon of Scripture is not a subject for Sola Scriptura, but must be a prerequisite to it. You can’t follow scripture alone if you don’t know what scripture is. So when I want to understand math, I don’t turn to the Bible, I open a math book, this is not abandoning Sola Scriptura. You are trying to force that meaning into it. And you will continue to misrepresent the position and show that lack of understanding with these silly gotcha questions. But the response shows the essence of the problem. You say I misdefine Sola Scriptura, and then you give a definition. Fine, but… is that how God defines Sola Scriptura? What is the source of your definition, and how did you determine whether that definition correctly states the doctrine? If Sola Scriptura is a Christian doctrine, then it has to be revealed by God, and we must conform our understanding to God’s understanding of that doctrine. What do you look to in order to get God’s understanding of the doctrine of Sola Scriptura so you can be sure your understanding is correct? Are you saying there are beliefs and practices that a Christian should have that are not found in the Bible? What is the source for those beliefs/practices? How do you determine whether any particular belief or practice is a valid Christian belief or practice? Don’t you go right back to the Bible to determine that? And what do you do with a belief or practice that you cannot find in the Bible? Isn’t that why millions upon millions of people reject infant baptism? ” is that how God defines Sola Scriptura?” 2 TIM 3:16-17: “All Scripture is God-breathed and is useful for teaching, rebuking, correcting and training in righteousness, so that the servant of God may be thoroughly equipped for every good work.” I’d say that is God’s definition. The believer need only look to scripture to be thoroughly equipped for every good work. The Catholic position is not going to be able to stand up to the same level of questioning you are throwing my way you know. The Dogmas of the Catholic Church, especially later developments such as the Immaculate Conception and Bodily Assumption of Mary, Papal Infallibility, ect. cannot be traced back to the teachings of the Apostles, and there is no reason to believe that when Paul talks about what he taught, he is referring to these late doctrines. There is no reason to even believe that when Paul or Jesus talks about the Church, they are referring to the Roman Catholic Church. The modern Catholics love to read back into the bible the anachronisms of modern day Catholicism but it is unwarranted. “How do you determine whether any particular belief or practice is a valid Christian belief or practice?” If a belief or practice is faithful to Scripture, then it is valid for the Christian. I don’t claim to get everything right, but the main, important issues that are necessary for salvation are pretty clear and are not in dispute among Christians. So the question is turned back to you “How do you determine whether any particular belief or practice is a valid Roman Catholic belief or practice?” And ultimately the only answer you can fall back on is because the Roman Catholic church says it is. I have the infallible Word of God, to which the only higher authority that can be appealed back to is God, you rely upon the traditions of men. You keep throwing the word Roman around. Catholics believe there is only one Church. Roman is a RITE , of which there are many , Syrian, Greek, e.t.c Those Christians you see being Executed for worshipping Christ in the Middle East are part of the same tradition. Coptic, Orthodox, Chaldean, Oriental. They wall worship the same exact way and teach almost the exact same thing for 2000 years. It seems you’ve been taught to hate or at that the very least to combat all things Roman Catholic, Maybe this is because the Protestant reformation is a event that ONLY happened in the Roman Rite in Germany affecting only Western Europe , not affecting the rest of Christendom? IMO any theology that teaches you must constantly attack others way of teaching only shows the weakness of its own practice. There is only One truth , state it with words if you must but if it’s True, it will be able to stand on its own . You claim your only appeal is to GOD , YOU turn GOD into a schizophrenic who tells people different interpretations of scripture, or are you now a prophet , who has direct access to GOD and everyone elses interpretation of scripture is wrong. YOU claim this authority , which is it? Proof: You believe in a 66 book Bible. Where in the Bible did God reveal that knowledge to you? If it’s not there (and it’s not), then there is no biblical basis for you to believe it, and it’s a manmade tradition. Pure and simple. You quoted 2 Timothy above. Where did you get the idea that that’s part of the Bible in the first place? What part of the Bible told you that 2 Timothy is inspired? Instead, he says when controversy and difficulties arise, look to the holy Scriptures. Evidently Paul already had something in mind. And how did you determine what Paul had in mind? What part of the Bible does Paul tell you to consult to test whether the Protestant idea of a 66 book Bible is correct? Thank you, Mr. Gore, for a clear and intelligible explanation. I would hope that others, if they wish to engage you in discussion, would be sensible enough to both read and comprehend what you’ve written. Jerusalem fell and 76 ad , The Roman Empire completely destroyed every last stone and tried to erase the place from the map. During the Islamic expansion Alexandria and Syria fell under Muslim control. Christians are still there today 2000 years later worshipping the same way they did during the time of the apostles or shortly after. That left the Greek/Byzantine and Roman Rites of the Church. Byzantine fell in 1450 to the Muslim Ottoman Empire, which left only the Roman Rite. Mind you I’m skipping a lot of history here trying to prove a point, when Rome was sacked around 460 the Roman Rite didn’t get back on its feet until Charlemagne around 800 ad. Second , the question of what the 1st center Roman Catholic read of Scripture , of which there was most cerainly a Roman Catholic. Well he wouldn’t , because he could not read. Before the printing press and the industrial age the literacy rate was dismal. There simply was no need for the average person to learn how to read Scripture. But lets stick the the ludicrous assertion that a 1st century average Roman Catholic could read , what would it be? The Old Testament , that is what Paul was telling Timothy because there was no new Testament. The first time we see all the books of the New Testament together was during the 4th century. We know that most of the New Testament was written during the end of the 1st century. Again there was no printing press , everything was copied by hand and took a lot of time, people took it seriously , it was THE WORD OF GOD. Most missionaries during the fist 1000 year of Christendom were lucky to have a copy of one Gospel to carry with them , but to assume they had all the books of the New Testament is false. Or, if you’re really into heavy reading, you can pick up a copy of Wayne Grudem’s “Systematic Theology” for about $25. Yeah, except basing our faith on the first 400 years of “biblical Christianity” means recognizing as Sacred Scripture 7 books not found in your redacted Protty bible. The Deuterocanonical books are inspired. They were eventually removed by Protestants because they contain teachings which contradict Protestantism, such as prayers for the dead. The Protestant, using his own theology, cannot properly answer the question: How did God reveal the canon to us? Whatever answer a Protestant gives, the next statement is going to be: Show me where in the Bible you found your answer. Using his own theology, the Catholic can answer that question. The Protestant has no such ability. There is a great debate on how the man of God (or me today) knows what the canon is. I can’t post links but Google James White canon of scripture if you want to hear a solid Protestant exegesis on the answer to your question. Maybe not, but you are truly interested he’s a good resource. There is definitely a huge “Dividing Line” *wink* between Protestantism and Catholicism on this issue, and Dr. White’s debates are a wonderful resources on the issue. In fact, he is debating Trent Horn from Catholic Answers tonight in Georgia on the issue of whether one can lose their salvation. Don’t forget Dr. Michael Kruger, he has excellent work in that area as well. Why do y’all consider James White the authority on what constitutes the canon? How do you test whether his assertions are correct? We don’t I was just referencing a teaching that is helpful and articulate. I did not make the statement you alleged and in an online commentary it’s wrong for any of us to think that we see even a fraction of each other’s character here. I don’t look at Catholics as opponents but instead as people who are seeking the truth. If we can work together to find it then we should. The issue of losing ones salvation has nothing to do with a dividing line between Catholic and Protestants. Most Protestants believe and have always taught you most certainly can lose your salvation. Only reformers who follow the doctrine of John Calvin , Once saved always saved , do not believe one can lose salvation. You are being overbroad there. While I follow reformed theology, I know plenty of synergists who believe in eternal security. I would say they are being inconsistent, but that particular belief is not exclusive to Calvanism. It just is most coherent there. And that subject is very pertinent to the Catholic Protestant debate as the Catholic doctrine of Mortal/Venial sins and merit-based salvation compared to the Sola’s of the Reformation is going to be front and center there. Not to derail the subject, but with that claim that one can truly be saved then lose that salvation, can you deal with sections like John 6? Especially where Jesus says “All those the Father gives me will come to me, and whoever comes to me I will never drive away.”.. “And this is the will of him who sent me, that I shall lose none of all those he has given me, but raise them up at the last day.”…”No one can come to me unless the Father who sent me draws them, and I will raise them up at the last day”(John 6:35-44). Those who’s theology teach you can lose salvation,Anglican, Lutheran, Methodist, Armenian Baptist , All Free Will Baptist Church. Some Pentecostals, and some evengelicls. Fact, only followers of John Calvin teach this. No one else in history taught this. Protestants or Lutherans and Anglicans from which Methodist and Pentecostal derive have always taught loss of salvation. Presbyterian and some Baptist are not Protestant they are reformed and as such follow John Calvins work. Armenian Baptist being the exception of course they are Protestant in as much as they believe you can lose salvation. I don’t think my conclusion in MOST believing you can fall from grace is overboard. I’m not concerned with counting noses as to who has their theology right. And I think (as my experience has been) that if you were to actually ask many members of those groups listed, you would be surprised the mixed beliefs on that issue. So how would you interpret the section listed above in John? As of yet, the only viewpoint that I have heard that is able to take that section in context and walk through it consistently it is the Reformed view. It sounds from other comments that you are a Catholic. Has the Roman Catholic Church given it’s infallible interpretation of that section of scripture yet? Are you as a lay member (if you are) allowed to read the Bible and give an exegesis of what it says or do you need to defer to a priest? After all, what good is an infallible scripture without an infallible interpretation of it, right? I was only correcting your false accusation of some sort of dividing line between Catholics and Protestants being the issue of theological teaching on someone losing their salvation. You accuse me of going overboard board, when I was just tring to be nice and show you that most protestants teach exactly that you can lose your salvation. Now you accuse me of counting noses as to whose theology is right? Even among Protestants that believe salvation can be lost, they believe it for totally different reasons than the Roman Catholic. And I mentioned counting noses because instead of telling me how you interpret John 6, you actually just replied by telling me how much of a minority I am supposed to be in. But that is not evidence for a belief being correct, so it doesn’t matter whether that statement is accurate or not. Sorry if you feel bruised. You have been perfectly civil in our discussions and I certainly appreciate that. I’ve already read what James White has had to say on the matter. Many times. But do you see what the problem is here? You believe in Sola Scriptura, a doctrine which states that the Bible is the sole infallible rule of faith. In trying to determine whether something you believe is true, you consult the Bible. But in order to consult the Bible, you must first know what constitutes the Bible. If you don’t know what constitutes the Bible, you may be looking at something that is wrong or incomplete. So, that goes right to the first question that needs to be answered: What IS the Bible? The only — repeat, the only — opinion that matters on that issue is God’s. James White’s opinion should hold no water for you. He’s just a man. So, how do you determine God’s opinion on the canon? Due to your belief in Sola Scriptura, the only way you can do so is by consulting the Bible. The problem? The Bible does not contain that information. Thus, you are left with no way of knowing… no way whatsoever… whether you are correct. In talking about one of your fundamental beliefs, instead of pointing me to the alleged source of your beliefs, i.e., the Bible, you pointed me to James White. Do you not see how problematic that is? When you read James White’s analysis of the canon, what part of the Bible did you search to test whether he is correct? What did you think was Whites most persuasive argument? I do not think that any one particular assertion of James White is more persuasive than any of his other assertions. The issue of the canon is a fundamental issue that no Protestant can answer while at the same time holding to the doctrine of Sola Scriptura, and the reason is simple. In order to test whether the Protestant view is correct, I have to resort to the Bible. Where in the Bible do I find the answer to the question? Well, can you give the cites again? Obviously I missed it. What part of the Bible do you consult in order to figure out what the canon is? I’m looking for particular cites. I’m supposed to emulate the Bereans and “search the scriptures,” so that’s what I’m attempting to do. You can emulate the Bereans or you can emulate Jesus. You need to deny yourself and follow Him. The first time you get in the deep end you don’t actually know that you will be able to stay afloat. You just have to jump in. Deny your fleshly desires and trust God. You have to turn to Him for answers. His Holy Spirit will guide you into all truth. The problem there is that you can’t set aside part of it without setting it all aside, without compromising. If it’s the word of God then it’s infallible (and you do know that the Bible is infallible I hope) otherwise it’s not. When it comes to the canon, there is no debate. Protestants believe in a 66 book canon, but they have absolutely no biblical basis upon which to do so. Being bound by the Protestant doctrine of Sola Scriptura, and having to test all things by Sacred Scripture, the belief in a 66 book Bible fails. That belief is not found anywhere in the Bible, which means it should be rejected by the Protestant, as it is in direct contradiction to Sola Scriptura. No one cares what any mere man’s opinion of the canon is; they care only about what God’s opinion is. But how did He reveal that opinion? Through Scripture? Where? And if God did not reveal the canon through Scripture, how can a Protestant know what the canon is? It doesn’t matter that the Hebrew canon does not contain the Deuterocanonical books. That’s not a criterion for canonicity. If a Protestant maintains that it is, then the burden is upon him to prove it… by showing us where that belief appears in the Bible. That said, the Protestant’s alleged sole rule of faith is incomplete anyway. Neither Protestants nor Catholics have the entire Bible. We know for a fact there are books missing from the Bible; they are mentioned therein. Saint Peter states that all Saint Paul’s epistles are inspired, 2 Peter 3:16, but Saint Paul refers to a prior epistle in his alleged first epistle to the Corinthians, 1 Corinthians 5:9. Thus, he wrote three epistles to the Corinthians, but we only have two. Saint Paul also refers to an epistle to the Laodiceans, Colossians 4:16. We don’t have that epistle. Saint James quotes a portion of Scripture that does not appear in any other part of the Bible, James 4:5, so there has to be Scripture that’s missing. You’re looking through the lens of a Catholic. Sorry I can’t help you. How did the man of God 50 years before the time of Christ know what the canon was? Where is the evidence? There isn’t any, yet there was indeed a canon, because Jesus held men accountable to it. Okay. Well, let’s look through the lens of Sola Scriptura. Sola Scriptura is the alleged lens we must use to test all things. You assert that the Bible contains 66 books. What part of the Bible do you use to come up with that assertion? How did God reveal the canon? Was it through the Bible or through oral tradition? If through the Bible, where? If through oral tradition, what is that oral tradition? And how do we test whether the oral tradition is correct? Not one single quote from Sacred Scripture is being used to demonstrate the Protestant position on the canon. Yet, that is the Protestant’s only infallible rule of faith. So, the rule of faith for a Protestant cannot answer the most fundamental question for him that exists: What is the Bible? He has to know the answer to that before he can start searching it for his doctrine. Unfortunately for the Protestant, he cannot answer that question. At all. You got the definition of sola scriptura wrong. Tens of millions of people who believe/d in Sola Scriptura also believe/d in, and practice/d, infant baptism. Tens of millions of people who believe in Sola Scriptura do NOT (for those in the past, did not) believe in, and practice, infant baptism. You believe there are Christians on both sides of that issue. Thus, the Holy Spirit, according to you, inspires one group of Christians to believe that infant baptism is a Christian belief/practice at the same time He inspires another group of Christians to believe just the opposite. The absurdity of that position is manifest to any thinking person. Protestantism, which enshrines private judgment, is utter confusion. God is not the author of confusion, 1 Corinthians 14:33. Gods wisdom is foolishness to the world. I’m not confused at all. Then what is the answer to the question of whether infant baptism is a valid Christian practice/belief? When you say a valid Christian belief what does that mean to you? I’m being serious I want to understand what you see infant baptism is. Some believ that it cleanses the baptized baby from sin; others believe it is a dedication of the baby unto God by parents who desire to raise their child in righteousness. About which position are you referring? Regardless of the efficacy of the act, does the Holy Spirit teach that infant baptism should be practiced by Christians? I appreciate your clarification. The question you’re asking doesn’t take into correct understanding who the third person of the Trinity really is. We have clear teaching on the subject of baptism in the Bible. Water baptism is a response to God by someone who has put their trust in Jesus as their messiah. The Holy Spirit confirms this in the heart of the believer by bearing witness to the truth. Let me ask you a question now. Is it a sin for me to eat ice cream? If it is or is not (and I do know the answer), how do I know? My question deals specifically with the topic of infant baptism, and the answer is either yes or no. If you prefer, I will reframe the question. Does the Holy Spirit confirm, in the heart of the believer, the belief that infant baptism is a valid practice that Christians should engage in according to His will? Infant baptism is either a valid Christian practice willed by the Holy Spirit or it is not. I imagine you can see the problem. Millions of people whom you consider to be “believers” have a belief that infant baptism is biblical and is part of Christianity (e.g., Lutherans, Anglicans, others). But millions of people whom you also consider to be “believers” have the direct opposite belief (e.g., Baptists, Fundamentalists, others). Both sides claim to be believers, both sides claim that the Holy Spirit confirms in their hearts the truth about infant baptism, both sides believe the other side to be in error, but the two sides contradict one another regarding infant baptism. 1. The Holy Spirit contradicts Himself because He confirms in the hearts of one set of believers the belief that infant baptism is a valid Christian practice that every Christian should follow, at the same time He confirms in the hearts of another set of believers the exact opposite belief. 2. The Holy Spirit does not necessarily “confirm things in the heart of each believer by bearing witness to the truth.” The believer can get things wrong, even though he thinks he is right. And in the matter of infant baptism, there are tens of millions of believers, down through the ages, who have been wrong about it. What is the answer regarding infant baptism? Does the Holy Spirit confirm in the heart of the believer, by bearing witness to the truth, that the believer should be practicing infant baptism? The answer, as I’ve stated, is no. Read a little more carefully my last response. An infant cannot put their trust in Jesus and therefore cannot respond in obedience. But does the Holy Spirit tell believers that the answer is yes? If you say yes, then the Holy Spirit contradicts Himself. If you say no, that means you don’t believe the people in the first group are believers (which would be all the original Reformers, Lutherans, Anglicans, the first Calvinists, et cetera). Do you believe that someone who believes in, and practices, infant baptism is “a believer”? You’re going to have to ask God that one. Best of luck, I’ve tried to be helpful and conversational with you. It’s pretty obvious you just want to put words in my mouth, demand I conform with your definitions, and generally place me in the categories you choose. Sorry I can’t be of more help to you. A person who loves truth will not be afraid to seriously examine his own position. Your position is contrary to truth, and because Christ is Truth incarnate, it is contrary to Christ. If you are correct, and the Holy Spirit “confirms things in the heart of every believer by bearing witness to the truth,” then the Holy Spirit contradicts Himself on points of doctrine and Christian practice. Answer: Because believers contradict themselves on points of doctrine and Christian practice. b) the Holy Spirit convicts one group of believers to believe one thing while convicting another group of believers to believe the exact opposite. In other words, He contradicts Himself. Those are the only two possibilities involved in your position. And infant baptism is only one doctrinal issue. There are all kinds of other issues in which you personally contradict other believers. How is it possible then that the Holy Spirit convinces you of one thing but He convinces another believer of the exact opposite? Do you not see what your position entails? If there is anyone who contradicts you on even one point of doctrine or practice, you cannot possibly consider that person to be a fellow believer because, if you do, then you would have to admit that the Holy Spirit contradicts Himself. And the chaos comes in when it’s the other person who says you are not a believer because the Holy Spirit convinces him that you are wrong on any given point. That is the very essence of Protestantism. The private judgment of millions causes them to contradict one another, but they all claim that their ideas/beliefs come from the Holy Spirit. No rational, thinking person could accept such a position. I rebuke that spirit of accusation in the name of Jesus. Okay, I consider myself rebuked. Now, how do you logically explain your position? If the Holy Spirit enlightens every believer regarding issues such as infant baptism, how is it possible for believers to disagree among themselves? You obviously see the irrational nature of your system, and that is why it cannot be explained without resorting to the idea that others just don’t understand. If they don’t understand, then don’t you feel an obligation to explain it logically to them? 1 Peter 3:15. Because your system is irrational, it cannot come from God. God is completely rational. In fact, He is Reason itself. You believe all babies who die through abortion and at a very young age go to hell; do you not? If your answer is no, please explain how an unborn baby, who is totally incapable of having faith, can be saved by faith alone. Just wanted to add that I have no intention of putting words in anyone’s mouth, nor am I trying to get anyone to conform to any definitions. The only thing I have been doing is applying your theological opinions to the real world. Your position is that the Holy Spirit confirms things in the heart of a believer, and that way the believer can know that he is right on any given issue. Starting with the issue of infant baptism, if the Holy Spirit has confirmed in your heart, as a believer, that infant baptism is not a Christian practice, then the only logical conclusion you can come to is that anyone who believes that infant baptism is a Christian practice is not a believer, in other words, not a Christian. If you do not come to that conclusion, then the only other conclusion available to you is that the Holy Spirit contradicts Himself. He tells one believer one thing, and He tells another believer the exact opposite. Do you not see that those are your only two options? And that’s only one issue. There are many, many issues where people who claim to be believers disagree with you. But if the Holy Spirit has enlightened you, that means you are right, but that means the others don’t have the Holy Spirit. Well, you can easily dispel that notion by just telling the readers how you apply your doctrine to real life situations, e.g., infant baptism versus faith alone, Sola Scriptura versus a belief in a 66 book canon which is not found in the Bible, et cetera. A further post to say: Nothing I have stated was meant to denigrate you in any manner, nor am I arguing. My apologies if what I say seems blunt, but all I am doing is applying your beliefs to reality. If you believe that the Holy Spirit enlightens the believer on what to believe, what do you do when you come across someone who makes the same claim yet contradicts you on a point of doctrine? And what do you say to outsiders like me who encounter two Protestants who make such claims? Which one are we supposed to believe has the truth? We’re talking about doctrine and salvation issues, so knowing the truth on such matters is paramount. What do you say? “Well, you don’t have the Spirit, so you just don’t understand.” But that’s what the other Protestant is saying to you. And a Catholic is standing there, watching the two of you contradict one another, yet both claiming the enlightenment of the Holy Ghost. One of them has to be wrong. Is it possible it could be you? A person who doesn’t ask himself those questions because he just “knows” he is right is basically claiming to be infallible. Do you consider yourself to be infallible? If your answer is no, then that extends to your understanding of infant baptism. You could be wrong. And there are hundreds of millions of people who say you are. You’re confused, and the statements you’re making aren’t blunt, they’re false. That is the typical response when a Protestant cannot logically respond to a discussion concerning his beliefs. Each one is convinced that he understands Sacred Scripture and the power of God, which makes everyone else wrong. That is why there is total chaos among Protestants. Well, if I don’t understand them, why do you refuse to clear up my misunderstanding? What I have been discussing is merely your doctrine. It’s what you claim to profess. Do you not believe in your own doctrines? 1. The Holy Spirit “confirms” things “in the heart of the believer by bearing witness to the truth.” Those are your exact words. 2. Salvation is by faith alone. 3. There is only Heaven or hell after this life. You believe all three of those things. Fine. Now, bearing in mind your doctrine, and assuming that all three points above are what the Holy Spirit has enlightened you to believe, what does the Holy Spirit confirm in your heart, bearing witness to the truth, about the fate of unborn babies? And the problem here is that you don’t know what Jesus held men accountable to unless you first assume that what you’re reading is Sacred Scripture. And how did you determine that it was? Everything is in agreement with itself. My authority is God, through the Holy Spirit. A catholic’s is the Church, through the Holy Spirit. And how did God reveal the canon of Sacred Scripture to you? AL is ‘structured’ along the lines of “it depends what the meaning of is…is”….intentional ambiguity..to my eye. -the issue of poorly formed marriage is a serious one, one that many cultures have diluted to pure civil contracts, wrapped with affection. Many Bishops and Cardinals are not up for the challenge…a daunting one to say the least, to clearly communicate and preach the message of marriage and how it conforms to the Mystical Body of Christ, the Church, and ultimately our Salvation. First Dogmatic Constitution on Church (18 July 1870) Vatican 1. I do not disagree with Zmirak, but this must also be addressed. Discipline and government of the Church. Right, so we can’t remove pastors, depose bishops, etc. None of this means we must adhere, openly or tacitly, to heretical statements. Correct. We vocally reject their novelties and obey God, not man. Jesus Christ warned us about the false shepherds. They existed in His day. We are not obligated to support financially a heretical bishop or a bishop who opposes the teachings of Christ. We are obligated to pray for them, but if they refuse to adhere to the teachings of the Church or openly or covertly (removing kneelers, interfaith ceremonies, omitting dogmas) oppose the True Doctrine of Faith, we are obligated to resist. The poor Catholics who opposed Arianism were kicked out of their churches. The true Catholics held the Mass in the fields. Catholics must always remember, the True Faith has Four Marks – One, Holy, Apostolic and Catholic. One – Unity in beliefs (all beliefs – no cafeteria options available), Holy (set apart for God, not mixed with the profane or worldly – think of worldly pics in Church instead of Saint statues, the Crucifix, silence) Catholic (universal – all men no matter what country or origin are called to believe in the one True Faith) Apostolic (traditions that go back to the Apostles). Clearly, the V2 Church does NOT have these Four Marks. Pray the Rosary everyday and find a traditional priest, if you can. Thank you to the author for writing a clear and reliable article. Jesus could do that because he was Spirit anointed (the Spirit descended on him like a dove). As was Paul, and the rest of The Apostles and disciples, as is anyone who accepts the promise of The Holy Spirit as described towards the end of John’s Gospel. This is why Paul too was able to explain the shortcomings of the law, not because he was GOD. He was Spirit anointed, and being Spirit anointed is not some magical mystical state of being, but rather the fruit of the dedication of a true heart. The Parable of The Sower addresses this. The Parable of The Sower is the most important parable. And yes, Paul was anointed with The Holy Ghost (Acts 9:17-18), and yes, there is the promise of The Holy Ghost (Acts 2:38). So have you even read the Bible? Or do yo just stick to Wikipedia? What about the frequent claims Jesus makes of his own divinity, such as his Son of Man title, assigning the actions of Jehovah in the OT with himself, all of John 1:1-18, Jesus use of ego eimi (I AM) phrases of himself, and many other examples where Jesus lays a claim on divinity and equality with the Father? Not to mention that the Holy Ghost (Spirit) is considered the down payment to all believers (2 COR 1:22) so according to your logic, shouldn’t we all be qualified to write scripture if we have “the fruit of the dedication of a true heart” like you say made Paul “Spirit annointed”? Jesus is God. Arianism Is a old gnostic heresy. Slinging scripture around does no good without any authority, and no Joseph Smith is not a authority. You reduce Christ to a mere man, as if anyone anointed with the Holy Spirit could have taken his place on the cross. Blasphemy. I am 67 and do not know if I will outlive this pope. But if I should, what direction will I see our Church go? I am hopeful that the African bishops and others will remain courageous and battle the protestants in our Church. the problem seems to lie with the people who are INTERPRETING amoris laetitia as being contrary to the time-honored teachings of the RCC. i would also point out that the early Church did not have marriage tribunals or canon lawyers, per se; nor even written canon law for that matter. i suspect for many centuries divorces and re-marriages were in the venue of “holy discernment” of the parties involved under the guidance of a reliable and faithful cleric. Is there disagreement within the Catholic Church on how many times the Pope has spoken Ex Cathedra? What good is it to have an authority who can speak infallibility when there is not an infallible list of when it has happened? Is there any way for the average Catholic to know within the lifetime of the Pope in question whether anything he has spoken is actually infallible? Or can it only be judge subjectively in retrospect? How can the Church call someone the Vicar of Christ when they do not believe or teach what Jesus and the Apostles taught? There is no list of ex cathedra teachings besause it has only happened twice. He is the Vicar of Christ because of heads the direction of the Church, all Bishops are teachers of the Faith. Even as the Vicar of Christ, he can’t go against the Magisterium, or Church teaching. Remember the Pope is not filling in for Christ, he sits in the chair of Peter, even Peter was wrong and corrected by Paul. We all fall short even the Pope sometimes. Thanks to the Church being guided by the Holy Spirit, the power of death will not prevail. I hope this helps. Actually, scholars think it happened a few more times. Wikipedia cites a book that lists seven such declarations, but the Church hasn’t officially cited more than two. So those other statements MIGHT be infallible.I agree with you that it’s an absurd situation, but that’s where we are. So how is the Magisterium (which you both admit is full of fallible, and sometimes heretical men) able to be corrected when it errors? When the bishops and pope are wrong, who is it that corrects them? Is somebody rebuking the current Pope when he teaches things that do not agree with Scripture or the RC tradition? I don’t see it happening. According to Catholic doctrine, is there anybody who is able to do this at all, or do you just have to hope that God just smites him? What if the Pope is content to just teach Heresy without claiming it is Ex Cathedra? Do you just have license to ignore the man who is called an Alter Christus or Another Christ, and is sitting in the seat of the authority of the Apostles (who by the way, seemed to speak with authority whenever they taught). Eric said he “heads the direction of the Church”, but is that a good thing when he seems to not believe most of what his predecessors believed or the teachings of the RC church for the last millenia? I have heard Catholics talk about having 3 sources of authority (Magisterium, Sacred Tradition, Scripture), but this doesn’t seem to be very accurate. After all, if the Magisterium is the one who determines what is tradition and how it is interpreted, and the Magisterium also determines the extent of Scripture and how it is interpreted, then you really are left with a single source of authority, which draws its justification for that authority from sources that it has control over. I think this is a major weakness. I have heard the Patrick Madrid saying “Sola Scriptura is a blueprint for Anarchy” but i think it’s actually the other way around. Sola Ecclesia only leads to error. I think the answer to the question you ask in the first sentence is: with chaos. If you look at the history of the Council of Nicaea, the entire time around it, you find plenty of bishops holding heretical opinions against the insight of the people. St. Athanasius, one of the heroes of the Council, was exiled several times afterward because emperors and other bishops went wobbly on the question while he did not. The history of that Council is very useful today, I’d suggest. Very many bishops convinced themselves that Arius had the better argument, but it was the people of the Church, along with a few persuasive teachers, who insisted that their shepherds hold true. But it was not pretty. If you’re a Protestant, you accept that Council as authoritative. As such, it should provide a useful example of how Catholics think of the entire process. While I, as a Reformed Protestant, would accept the council of Nicaea as authoritative, the reason for accepting it as authoritative would be completely different than a RC would. Any writing of an early Church father, decision of a council, or teaching of a church leader could only be considered authoritative in so far as it is in agreement with Scripture. If the decision of a council is in harmony and obedient to the message of Scripture, then it is authoritative. If it contradicts or disagrees with Scripture, then it has no authority. I can always evaluate the teachings and proclamations of any teacher claiming to be preaching the Gospel by comparing it with the Scripture, which is unchanging, rather than the constantly evolving theology of Roman Catholicism. Now does that mean that everyone who calls themselves a Christian have a Biblical understanding and properly weigh these things in light of Scripture? NO! That doesn’t change what the standard laid out in Scripture is though, it just means that many fall short of it at times (myself included), though more often than not the issue is obeying a tradition of men over the teaching of Scripture. Well, this is well-worn ground. I would simply point out that the Arian side of the question was very well represented by extremely smart guys who based their arguments very well in scripture, the gospel of John, in particular. If you really believe you can evaluate and refute the sophisticated Arianism of the theologians who took his side, well, you are historically ignorant and also think quite a lot more of yourself than is justified. The “constantly evolving theology of Roman Catholicism”. Your zeal to attack all things Catholic has blinded you my friend. First Catholic theology does not nor has ever evolved. Truths are most certainly “unpacked” over time , but to say they evolve is to insinuate that they change and of course this is not True, Not one Truth has ever changed in 2000 years. Sure some rules have changed like observances or fasting practices, they must , the Church must be organic to speak to different generations and different generations need different things. But interpretation of Sacred Scripture has NEVER changed. Second, you should be thanking The Roman Catholic Church not berating her. Protestants have always taught that birth control was a sin, Luther Calvin, all of them. It wasn’t until the early 1900s did all this change. Protestants interpretation of Sacred Scripture “evolved” into allowing birth control. In fact it went so far that the Southern Baptists supported abortion, thankfully it did not take to long for that to change. It was and is The Catholic Church , thanks to Pope Paul VI writing of Humane Vitae , where he highlighted the 2000 year old teaching of birth control , the line was held for all of Christendom. Today many Protestants and Reformed are turning back to the same position on birth control because they see the error that has cause so many problems in the family structure. You may disagree with birth control and thats OK, the overwhelming majority of Catholics disagree with this teaching, nevertheless i only use it as a example of how Truths NEVER change in the Roman Catholic Church. You are incorrect, the Magesterium is not nor has never been incorrect, Magesterium interprets Sacred Scripture in unison with Sacred Scripture guided by the Holy Spirit. Think of it as a check and balance. The Pope is not another Christ, at no time in human history has that nonsense been taught. Even though a Pope can, has erred, Christ built his Church with the intent to have it interact with the world for the salvation of all mankind. Just like St. Peter was the leader of the apostles , the Pope is the leader of the Church The Pope is carrying out the same mission of Peter, the Church is carrying out the same mission of the apostle. I hope this clears it up a little God Bless. I understand your answer, but do you not detect a problem? Assuming arguendo that you are correct regarding the Catholic Church, that does not somehow, by default, make the Protestant position correct. The Protestant position must stand on its own merits. The problem is that it does not, and the Protestant can recognize this. If Sola Scriptura were true, then the only way to figure out what the canon of the Bible is, is by consulting the Bible. How can it possibly be otherwise? Earlier, you stated that Paul told Timothy to search the scriptures for the answer to doctrinal questions. Okay. So, a question has come up, and it came up many centuries ago: What is the canon of the Bible? So, how does the Protestant “search the Scriptures” to find the answer to that question? Does he search something he calls “Scripture”? How can he do that, when that’s the very thing he’s trying to find out? He doesn’t know whether he’s looking at Scripture because there is no source that gives him God’s opinion of what Scripture is. On the issue of the canon, if SS is true, then I am bound by that doctrine to apply it to that question. In doing so, how do I determine what the canon is? I am interested in God’s opinion on this matter only. I assume that is true of you as well. And how did you figure out what His opinion is? I will discuss the Catholic issues you brought up in a subsequent post. I understand the point, but the reason for the divergence in opinion is due to the Protestant understanding of what “the Church” is. The Magisterium cannot err. It never has and never will. But you have to understand what Catholics mean when they make that statement. Of course, popes can err, and they have done so, but that does not negate the concept. You do not believe in an infallible church; the Catholic does. In fact, the Catholic must believe in an infallible Church, and the reason is very simple: Christ is part of the Church. Christ is the head of His Church, Colossians 1:18. Therefore, to assert that His Church can err is to assert that Christ is part of an erring body, which means that Christ Himself errs. Another reason: The Church is not only on earth. It also in Heaven. (We’ll leave purgatory aside for the moment since you don’t believe in it). The Church in Heaven cannot possibly err; thus, it is infallible. If the Church on earth could err, what that means is that Christ is part of an inerrant body (Heaven) at the same time He is part of an erring body (earth). This argument does not make any sense to me. If asserting that Christ being a part of the church means the church cannot err, how does this not transfer down to each member of the Church on your view? Do you believe that because Christ cannot err, and he is a part of the church, and you are a part of the church, therefore you cannot err? I doubt that you do. And if you don’t, what does it mean to say the Church cannot err, where there are many historical examples, and modern examples of Popes and Bishops with obvious differences in beliefs about faith and morals than the traditional positions of the RC church. An interesting historical example would be Pope Formosus and the Cadaver Synod, or the RC Churches acceptance of the forged “Donation of Constantine”? Or for a modern day example, look at your current Pope, who no reasonable person could say even holds the same beliefs on your faith as his predecessor. When Catholics say “the Church cannot err,” no, we don’t mean that that applies to each and every Catholic. We mean the Magisterium of the Church, that is, the teaching authority, that is, the bishops, from one age to the next, when teaching, as a body, matters of faith or morals that bind the Catholic. Individual bishops, even popes, can hold to erroneous opinions, and have done so, but their errors have never, nor can they ever, bind the Catholic Church. The Donation of Constantine, the Formosus episode, and other things like that do not fall under what the Catholic means when he speaks of these matters. It is always difficult for someone who is reared to think a certain way to step outside the box in order to look at his belief system, but that’s what the Protestant needs to do in order to evaluate his system using the same criteria he uses to evaluate other belief systems. When the Protestant honestly does that, he sees that Protestantism is contrary to logic, right reason, and truth. The canon of Scripture, when juxtaposed with the doctrine of Sola Scriptura, is the prime example. Applying Sola Scriptura, which the Protestant must do if he wants to remain Protestant, how does he determine what God’s opinion of the canon is? And when he comes to his answer, how does he search the Scripture to test whether his answer is correct? If he cannot do that, then that shows the fallacy of Sola Scriptura. And if Sola Scriptura is erroneous, that means Protestantism cannot be true. Continuing from the last post, another problem with Protestantism is the doctrine of Sola Scriptura itself. No one knows what it means, and no one can define it. When a person defines Sola Scriptura, he is merely iterating his own opinion of what the doctrine is, but why should another person care about what someone else’s opinion of that doctrine is? The only definition of Sola Scriptura that should hold any weight with anyone is God’s definition. But where does the Protestant go to find out what God’s definition of that doctrine is and how the doctrine should be applied? Tens of millions of people who believe in Sola Scriptura, from the 16th century until today, have held that infant baptism is consistent with Sola Scriptura. Yet tens of millions of people who believe in Sola Scriptura, from the 16th century until today, have held that infant baptism is NOT consistent with Sola Scriptura. Both sides cannot possibly be correct, as they contradict one another. That tells a person that there are tens of millions of people who claim to believe in a doctrine which they do not properly understand and do not properly apply. But here comes the problem: No one can say which side understands the matter properly and which side does not. They both claim to believe in the same doctrine of Sola Scriptura but come to diametrically opposed positions when applying it. That’s an example of the utter confusion that has resulted from centuries of Protestant private judgment. I say that the Vatican issuing a postage stamp of Martin Luther is clearly in the realm of heresy. While I’m sympathetic to Mr. Zmirak’s desire to clarify papal infallibility, he needs “to hunker down” and study more deeply on the matter. The one clear good fruit of the current pontificate is the push back on papalotry (or ultramontanism or “papal positivism”) that became rampant under the recent popes. This is a very sloppy article and contains errors. Would that journalists actually run their articles past well-trained theologians before publishing. Unfortunately journalists that are catholics have a bad habit of thinking that qualifies them to write on catholic doctrine as if the Magisterium had a fourth estate. The explanation of the relationship between Scripture and Tradition is sloppy. This smacks strongly of “conciliarism”. For a council document to be binding, the pope must promulgate the document. Councils are subordinate to popes, not equal. Ironically for Mr. Zmirak, it was conciliarism arising out of the Council of Constance (which dealt with the Western Schism and anti-popes) which helped lead to protestant errors. Wrong. It’s not that simplistic. ONE example: The universal agreement of the Fathers on interpretation of Scripture. The explanation of the ordinary magisterium–particularly in regard to repeated teaching–is sorely lacking. This is a poor attempt at explaining development of doctrine. In the end, in Mr. Zmirak’s attempt to clarify, he’s only added to the confusion.